Xīnnián de zhùfú, píngrì de xījì, yuàn nǐ xīnjìng xiánghé, chōngmǎn ài yì, yuàn nǐ de shìjiè quán shì měimǎn, yuàn nǐ yīqiè chènxīn rúyì, kuàilè wúbǐ. Happy Lunar New Year! It's that time of year to receive blessings and bless each other. Check out 15 fabulous blessings to share or bless yourself with. If you have time read 108 Chinese New Years blessings. The astrological predictions are a good time for expats like me to see how Taoism is acdmittadly practiced. I myself am a Tiger (apparently a brave-hearted, humanitarian loner, with a ferocious bite) and if I believed any of this I could read what a Taoist seer predicts how the monkey year will be for me (to read yours click here). They all seems like doomsayers to me. Prior to coming to Taiwan I was (and still am) fascinated by the words of Lao-tse and the Yi-Ching and their influences on Chinese culture and cosmology. In the years living here I have aquired immeasurable recommendations about eating and preparing food according to the weather, season, my menstrual cycle. This is Taoism and the principals of the 5 elements in practice on a very practical day to day level. The 5 elements are found everywhere and in everything, each organ, hour of the day, not to mention every year is ruled by this relationship between light and dark and the 5 elements. It gets all beyond my understanding when I read the writings of Lao-tse which speaks nothing of deities and yet in Taiwan Taoist temples host literally hundreds of gods and goddesses. 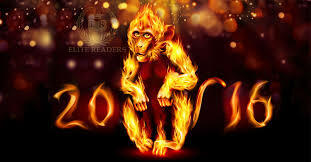 According to experts, the year of a fire monkey is seen to bring calamity and unpredictability. Taiwan surely experienced that with the Kaohsiung earthquake and building disaster in Tainan. It was a bereaved way to begin a New Year. Taoist fortune tellers and feng-shui masters offer advice on how to avoid further catastrophe, specifically on what to wear or not wear and placing special amulets in the homes. Women this year reputably will yield more power as indicated my the recent election of Tsai Ying-wen in Taiwan and perhaps Hillary Clinton in the near future. Time will tell but I'm voting for Bernie. As for myself, I staunchly recommend acupuncture and cupping for minor illnesses which like all Traditional Chinese Medicine is rooted in Taoism, but I deliberately draw the line about which metaphysical tutelary I consent to rule over me.